Out of every effect and creature that Teenage Mutant Ninja Turtles: Out of the Shadows could conjure onto the big screen, one was head and shoulders above all the others in its difficulty. Sure, a foursome of mutant turtles, a large rat, and a warthog/rhino criminal tag team are easy. But creating Krang, the disembodied brain from Dimension X? That was pretty difficult, if only because he's a character that doesn't really have a real life counterpart to use as a model. Brad Fuller said about as much during his interview with Screen Rant, as the Teenage Mutant Ninja Turtles: Out of the Shadows producer ran down the factors that made Krang such a difficult character to bring to life. How do you bring a brain like that to life? I mean how do you do it? What does that look like and what does that sound like? And how does he move? We figured out how the turtles move, and Bebop and Rocksteady. You know, you can kind of extrapolate if 6’6" talking turtles were walking this way, this is what these guys would look like. And Casey Jones and Baxter Stockman, OK, I can do all that. But then when you just [put] a brain into it and try and figure out what that’s going to be like, that was very intense. Fuller's not the only person who had specific guidelines and concerns with the design of Krang in Teenage Mutant Ninja Turtles: Out of the Shadows. As you'll remember, it wasn't that long ago that producer Michael Bay and visual-effects supervisor Pablo Helman were discussing how Krang should look on the big screen, detailing how the tentacles of his cartoon visage wouldn't fly with a CGI character inhabiting a live-action film. Which, of course, is probably part of the reason that the character has not been completely revealed in advertisements for the film. The other reason would be that, naturally, Krang is one of those elements you hold for the final film, as a treat for the true fans. But even true fans going back to the 1990's cartoon series would have to admit, adapting that original design for Krang would be extremely weird, especially in the world that the Michael Bay produced Teenage Mutant Ninja Turtles plays around in. So while there are certain concessions that the artists would make to tip their hats towards the cartoon variant of Krang, they need to make sure that it doesn't topple into a fully unbelievable character that no one will take seriously. 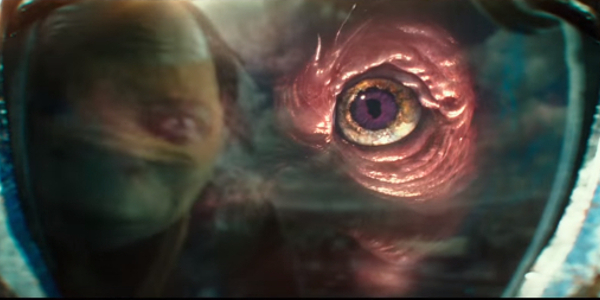 From the limited look we've been given in the trailers released for the film, it looks like the most serious selling point of Krang's character design would be the mock cyborg shell that he rides around in, as the technology fits with the aesthetic design of the world, while at the same time conveying the dead faced nature of Krang's original body. Take a look at this year's Super Bowl trailer below for a look at what we're talking about. Overall, Krang's design is fantastical enough to fit in with the sci-fi bent of the film, but at the same time it has that familiar feel that takes you right back to your childhood. At least, it looks like it has the potential to be that balanced, and you can see, and hear, the Krang of our modern age for yourself when you go see Teenage Mutant Ninja Turtles: Out of the Shadows, as it opens in theaters today.